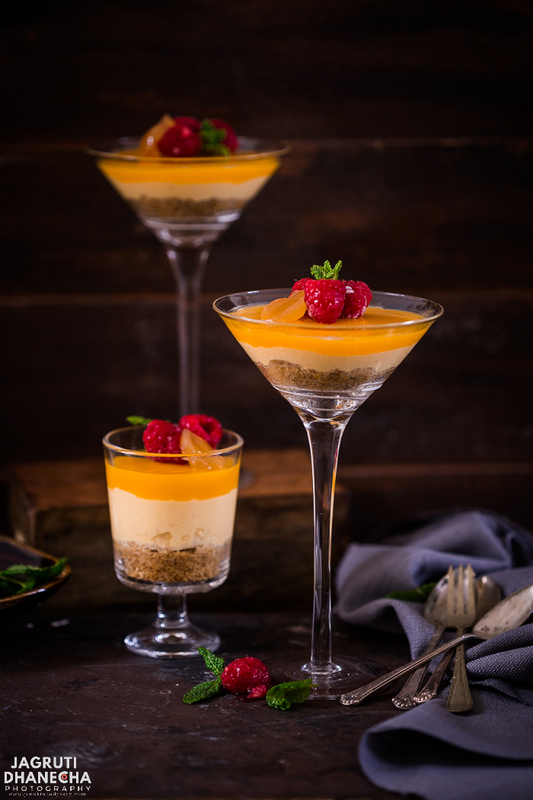 Heaven for any mango lover, luscious and exotic No Bake Mango and Ginger Cheesecake! A delicious new twist with spiced ginger. This pleasantly sweet cheesecake is an effortless recipe. It turns out right every time! Whether there is a mango season in your neck of the woods or not, this cake will satisfy your taste buds anytime. Celebrate the mango or mango season by making and relishing this Mango Ginger Cheese Cake. The word mango makes me weak at knees as I have a penchant for mango, after all, I am Indian. Indians and their fondness of mango go hand in hand. There is no denying that natures best creation, mango should be enjoyed on its own for the real taste and flavours, also to obtain the maximum amount of nutrition. 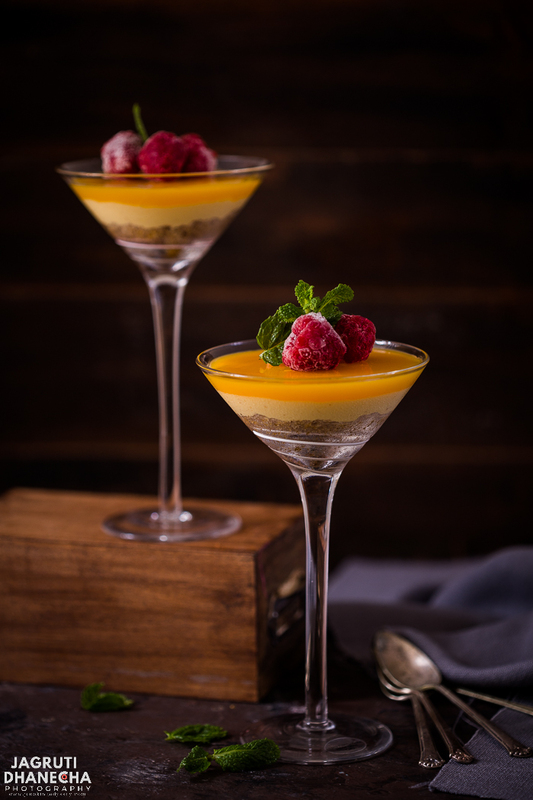 In my family, most of the time, sweet and juicy mangoes are devoured fresh, however, since I have joined this blogging world, seeing all these beautiful and tempting creations of mango recipes I too wanted to jump in that bandwagon and here I am with my recipe of No Bake Mango Ginger Cheese Cake! My No bake mango ginger cheesecake is assembled in three layers. 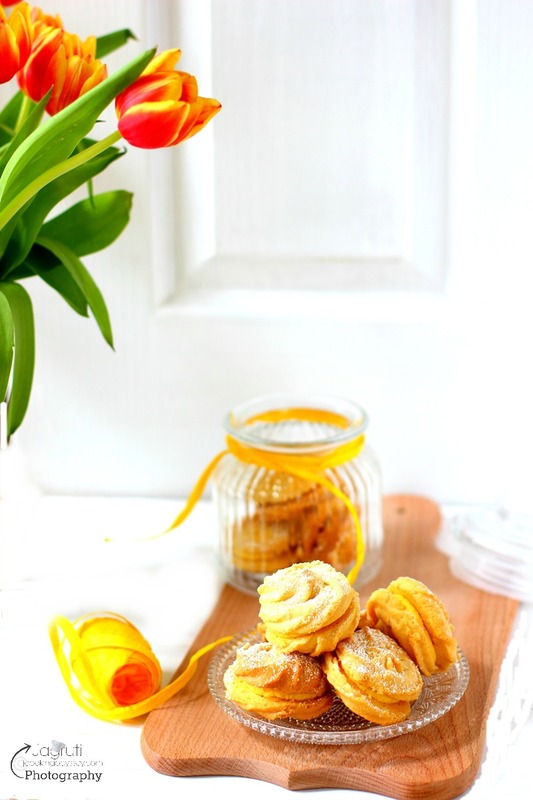 A base prepared with digestive and ginger cookies, a middle layer, a cheese layer that is made with cheese, cream, mango pulp and candied ginger. 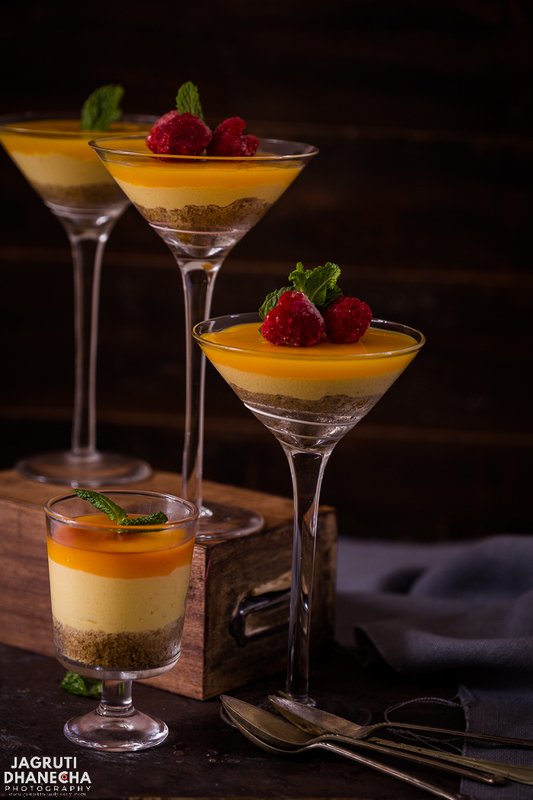 A cheese layer gets its golden colour and tropical flavours from stirring a mango pulp/puree in the cream cheese mixture and the third layer is the mango glaze layer which prepared with mango puree and agar agar powder. The mango and ginger in this cheesecake make it taste absolutely sensational. A perfect marriage of flavours, the candied ginger in the cheese gives a little extra zing and adds a little bite too. Mango - If fresh mangoes available choose very sweet mangoes if not you can always rely on tinned or frozen mango pulp. Indian mango pulp can be found in two varieties, KESAR and ALPHONSO any will do for this recipe. Ginger - I have used stem ginger which comes in a bottle with syrup. Cheese - Full fat cream cheese and Mascarpone Cheese. Margarine - I have not used butter, margarine keeps biscuit layer soft and crumbly. LIKE THIS NO BAKE MANGO GINGER CHEESECAKE? Then I am sure you'll enjoy browsing my other tasty cheesecake recipes which are gelatin and egg free also some are no bake too. This made from scratch no-bake mango ginger cheesecake probably the easiest cake recipe out there, no baking and hardly any cooking required. First in a bowl or pan place agar agar powder and add boiling water and let it bloom. If you are using agar agar stripes or flakes then cook on the stove until it dissolves properly. In a food processor add both cookies and crush it, add melted margarine and mix well. Spoon it in serving glass or springform pan and spread well. Press it with with the back of the spoon. Let it chill for 30 minutes in the fridge. Make cheese layer by whisking a double cream in a big bowl until fluffy, add both cheeses and beat for another couple of minutes. add little by little the mango pulp ( keep 1/3 aside ) to the cheese mixture and mix again, now add ginger pieces in the mixture and leave aside. Pour the half agar agar mix into the cheese and mango mixture, mix once again well. Pour this cheese mixture over the already prepared biscuits base, keep in the fridge for at least 3-4 hours. Now, prepare mango glaze by mixing remaining mango pulp and agar agar mix ( if it is too thick add a couple spoons of water) in a pan. Add a tablespoon of sugar and cook for 4-5 minutes. Transfer the mixture into another bowl and let it cool slightly then pour over the set mango ginger cheesecake. Let it chill the cake for another couple of hours. Serve chilled and enjoy. 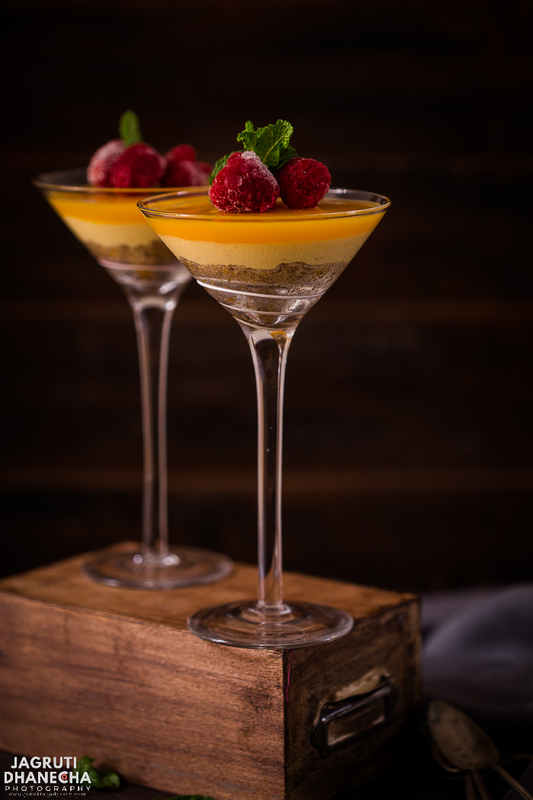 This silky, luxurious and indulgent No Bake Mango Ginger Cheesecake is a perfect treat for any occasion. Grind the biscuits into very small crumbs, melt the margarine or butter in a pan and add the biscuits crumbs to the melted butter. Mix well until it's coming together, Put this mixture into the serving glass or greased cake tin and press evenly. keep the base in the fridge for 20-30 minutes until it sets well. Heat the 1/4cup of water and add the agar agar powder, stir until they get dissolved, keep aside until get slightly cool. Beat the Mascarpone cheese and cream cheese in a large bowl until they get well mixed, in another bowl beat the double cream until light and fluffy. Add 2/3 of mango pulp little by little to the cheese mixture and mix again, now add ginger pieces in the mixture and leave aside. Pour 2/3 of agar agar mix into the cheese and mango mixture, mix once again well. Pour this cheese mixture over the already prepared biscuits base, keep in the fridge for at least 3-4 hours. Cook this mixture to for 3-4 minutes. let it slightly cool. Pour the mango glaze onto the set cheesecake. Again keep the cheesecake in the fridge for another couple of hours or until glaze is set perfectly. When ready to serve garnish the cake with berries and mint leaves. If you are using agar-agar strips or strands first soak it in water for half an hour. Then cook on the stove until it dissolves completely. If you are using it fresh mango for this recipe, then puree with little sugar. 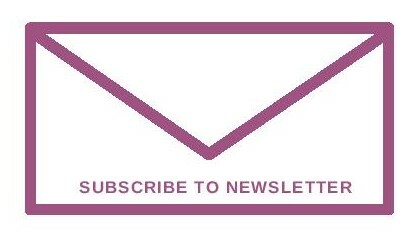 Note:- This post was originally posted in January 2010 but I have updated the post since with newer photos and content. OMG! Give me that plump aloo vada NOW! Looks so good, I am hungry now. Cheese cake looks perfect, love it. Delectable cheesecake and hot vadas, yummy! Lovely cake and the vadas sound yumm! Sweet with the savory.Lovely cheese cake and equally good wadas. Cheese cake looks so wonderful..Aloo Vada, the name itself sounds so yummy..
omg, that aloo wada looks so delicious! Its almost like its screaming 'eat me' :) Love the chocolate cheescake too; but my favorite it that aloo-wada picture still! Hey that pic on profile is of 3 yrs back. Somehow like that pic. So put it there.. Such a lovely cake and vada looks great too. Aloo vada looks mouthwatering. Perfect to have as a snack in the evenings. Aloo vadas are looking simply out of this world. And cheese cake looks so perfect and wonderful. Love any dish with mango! Looks perfect. lovely and spongy cheese cake and an equally yummy aloo vada to go with it.What more do u want? I am coming over leave some for me. Oh.. wow!! Jagruti... the dishes look extremely tempting!! and perfectly made :):)... very nice! Wow Jagruti, am speechless and cant take my eyes from that fantastic and gorgeous cheesecake that too with my fav mango and ginger, aloo vada makes me hungry..am totally hooked with ur both dishes rite now here..
Hi, I guess u said the new profile pic of mine reminds u of ur cousin! Anyways, Thanks for droping by my blog! I am wondering which one should I pick first , both looks so mouth-watering to me :)..
@Jaya...take aloo vada first,then have cake..after spicy food sweet goes really well.. The cake looks great and no baking - how great is that! Just one question - did u have any trouble taking the cake out of the pan? Any tips? I am guessing since it is refrigerated, it may be leaving the sides making it easy to pop out... am i right? omg, i am drooling seeing the aloo vada..yumm...nice to use ginger in the cheesecake ! Sounds delicious; ginger does add that extra dimension and cuts through cloying sweetness. @SE i like the combo of ginger and mango..in gujrat when you have mango ras in summer they add dry ginger powder to digest that heavy mango pulp..
@? you are right..plus i didn't use any extra sugar in there.. Thanks a lot for visiting my blog..
hey this looks so yummmyyyy..love the cheese cake with ginger crystals..Aloo wada looks so tasty..
these aloo vadas and the cake looks so tasty indeed,my stomach has just started to rumble,iam a regular follower of ur blog keep posting and i will attemt to make these mouthwatering lovelies. many congrats for recieving awards. Aloo vada looks delicious and mouth watering. Perfect for evening snacks. Cake also looks yummy. Lovely picture and wonderful presentation. Yum, delicious recipes... they look and sound amazing! Hi, you will be able to find ' STEM GINGER BOTTLE' in USA. Try your local supermarket.